A massive earthquake struck the city of San Francisco in the early morning hours of April 18, 1906. But worse than the damage caused by the earthquake itself were the fires which raged through the city for three days afterward. Ships coming into the harbor were turned away because there was no place for arrivals to go, and that is how Denjiro Nishitani, immigrant from Japan, came to Seattle instead of San Francisco as he had intended. Knowing no one in Seattle, Denjiro found his first job as a dishwasher in a restaurant. From there he made his way to northeast Seattle and worked as a farmhand. Through his determined efforts to advance himself, within five years of his arrival in Seattle Denjiro became the owner of a plant nursery called Oriental Gardens in what is now the Meadowbrook neighborhood. Copyright notice: text and photos on this article are protected by the Creative Commons Copyright. Permission to copy text and photos from this article, is NOT given. In the 1880s Americans were already developing sugar cane plantations in Hawaii. Like native American Indians, native Hawaiians had been decimated by diseases such as measles, and the population fell to the point that there was a labor shortage. Japan had the opposite problem in the 1880s: there was overpopulation and not enough jobs. In 1884 an American recruiter obtained permission from the government of Japan to offer jobs to those willing to go and work in the labor-intensive sugar cane plantations of Hawaii. The recruiter concentrated on the southern island of Japan which was the most agrarian and where the people had a reputation for being serious and hard-working. The USA took control of the Hawaiian Islands in 1898 and this opened the floodgates of immigration to the mainland by Japanese already working in Hawaii. It also set off a wave of immigration from Japan to the USA, so that up until 1910 about half of Japanese immigrants to the USA came from Hawaii to the mainland, and half came directly from Japan. The history of the USA is that of waves of immigrants, but unfortunately there is a history of “backlash” as well. Each successive group of immigrants will work at low-paying niche occupations while it is the perception of some that the immigrants are “taking jobs away” from Americans. In the 1880s the backlash response to Chinese workers was an 1882 law which prohibited further immigration. From 1900 to 1910 Japanese immigrants primarily settled in the western states of Washington, Oregon and California and many went into agriculture. By the 1930s the Japanese operated almost all the flower and produce markets in California. By 1913 California had passed a law restricting land leases to Japanese to three-year periods. In 1920 both California and Washington passed Alien Land Laws prohibiting ownership of land by Japanese, and in 1924 the federal Immigration Act terminated all Japanese immigration. In Seattle as in other areas the Japanese helped one another by forming economic support groups. A produce stand, for example, might be operated by a Japanese family and all of their products would come from Japanese farmers. The Japanese became expert at “truck farming” which is to plant fruit and vegetables that only take a short time to grow, can have several crops per year and have crops planted in rotation for successive ripening times. 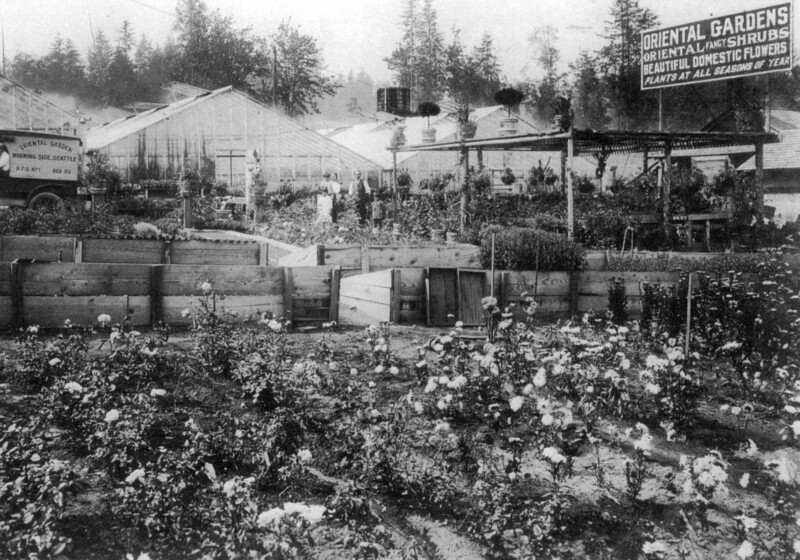 Greenhouses help crops such as tomatoes which need warmth, and in the 1920’s there were quite a few Japanese small farm/greenhouse operations in north Seattle. The longest-running was Denjiro Nishitani’s Oriental Gardens on Lake City Way at the corner of NE 98th Street. Denjiro Nishitani came from that same southern island of Japan which was agricultural and where the people had a reputation for being hard-working. Denjiro had a farm background and a real knack for growing things. After arriving in Seattle in 1906, he worked for about two years on a farm in Pontiac, in what is now the Sand Point area. Many young Japanese men were immigrating to the USA, but Denjiro was unusual in that he was 27 years old, married and the father of four children. Even more unusual was that, as the eldest son in his family, Denjiro could have stayed with his parents on the family farm which he was due to inherit. But Denjiro felt constricted by the limits of education and social status in his rural community in Japan. 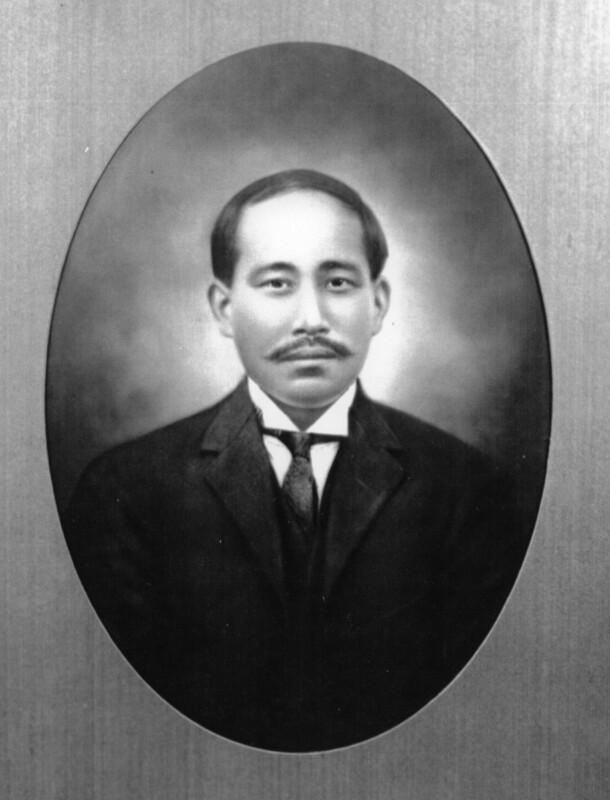 Since he was from a province which had had many people immigrate to Hawaii or to the US mainland, Denjiro likely knew of others who had succeeded in new lives in America. Denjiro’s drive to improve himself and make a better life for his family caused him to leave his heritage behind. He hoped to prepare a place for his family and bring them to the USA. J.D. Trenholme ran for mayor of Seattle in 1914. Denjiro’s big break came in 1908 when he got a job as a groundskeeper on the Green Lake estate of J.D. Trenholme, a wealthy Seattle businessman. Denjiro enjoyed the favor of Mr. Trenholme, who well understood the immigrant experience and was particularly inclined to be accepting of Asians. Canadian-born and from a farm background himself, at the age of 17 Trenholme had crossed over into North Dakota. He was able to raise his status with opportunities in North Dakota in banking and in studying law. He became a citizen of the United States, married and the father of four children. Yet he still wanted more for himself and his family so Trenholme came to Seattle following the Klondike Gold Rush of 1897. There were several parallels to Denjiro Nishitani’s experience, because J.D. Trenholme had also left behind a wife and four children for a period of two years while he tried to establish himself in business in Seattle. His family settled permanently in Seattle in 1899 and Mr. Trenholme became successful in operations of steamship companies, fisheries and import-export. As a person familiar with international trade, Trenholme well knew the value of Seattle’s connections with the Orient, including Japan. Denjiro Nishitani could hardly have found a more hospitable place to work than the Trenholme estate, and this must have shielded Denjiro from some of the racism of the time period. Denjiro was able to send for his wife Jin to join him in Seattle in 1909, and two more children were born to them while living on the Trenholme estate at Green Lake. With Mr. Trenholme’s encouragement, in 1912 Denjiro set out to establish his own plant nursery, including a cut flower business and landscaping services. Denjiro sent for his eldest son, Hiromu, who was twelve years old and had been living in Japan with grandparents, aunts and uncles. Hiromu entered Maple Leaf School where he was tutored intensively in English and was able to graduate from eighth grade by the time he was 15 years old. At school Hiromu acquired the nickname “Kelly” because of the kelly-green tie he wore. Kelly went on to Lincoln High School and also worked with his father in the landscaping business. As the eldest son, Kelly inherited the Oriental Gardens business and worked there the rest of his life. Oriental Gardens as it looked in 1916. The sign faced Ravenna Boulevard on the east side of the nursery. As yet there was no Lake City Way. Photo courtesy of the Nishitani family; all rights reserved. Do not copy. The Nishitani family operated Oriental Gardens on a lease basis starting in 1912, and then, in 1920, they purchased the property in the name of George, their first son to be born in the USA (in 1912 on the Trenholme estate.) This was a way to get around the Alien Land Law which took effect in 1921; by 1923 more laws were passed to close the loophole of buying land in the name of an American-born child. The Nishitanis seemed to stay just ahead of the closing of opportunities. They brought their three remaining children from Japan during the period 1917-1919, before all Japanese immigration was stopped by a federal anti-immigration law in 1924. Four more children were born to the Nishitanis at Oriental Gardens, completing a family of five sons and five daughters. Their tenth child, Connie, was born August 13, 1921, exactly twenty-two years from the birth of Kelly Nishitani. Kelly married in 1920 and his two sons, James and Samuel, were contemporary with Kelly’s two youngest sisters, Martha and Connie. In January 1920 the Nishitani’s third and fourth children, Yutaka age 15 and Misao age 13 arrived from Japan. They entered first grade at Maple Leaf School. Their American-born, English-speaking brother George, age 7, was in second grade in the same room of the Maple Leaf schoolhouse on NE 105th Street. George could speak some Japanese and he often had to help Yutaka and Misao understand what was going on. In 1993 I interviewed Misao, fourth Nishitani child, about her experience of entering the USA. She had been born in Japan in 1906 and when she came to Seattle in late 1919 she had no memory of her mother, and she had never met her father. Along with the shock of being transported to live with her parents and other siblings in the USA was the difficulty of entering school. Misao told me that the teachers of Maple Leaf School spent hours tutoring her and her brother Yutaka, just as they had done with the first and second Nishitani children, Kelly and Sadako. Like their older siblings, Misao and Yutaka were able to finish through eighth grade at Maple Leaf and go on to high school. Wedgwood Presbyterian Church moved to 8008 35th Ave NE in 1948 and built this building. The church was planted by First Presbyterian (downtown) whose workers came out to northeast Seattle to conduct Sunday schools. Called Morningside, the group met first on NE 92nd Street, then on the corner of NE 95th before its move to the corner of NE 80th Street in 1948. A fond memory of Misao’s was her participation in the Morningside Sunday School Union, an outreach ministry of First Presbyterian Church in downtown Seattle. The Morningside Sunday School met in a building used for the purpose, on the present site of 2548 and 2558 NE 92nd Street. Property records show that the site was purchased by First Presbyterian in 1917 for use as a branch location. Morningside was the development name for that area close to NE 95th Street, and it was often used as the neighborhood name before the 1940s when “Wedgwood” came into use. In 1923 the Morningside Branch Sunday School moved to the corner of NE 95th Street, present site of Northeast Veterinary Hospital, 9505 35th Ave NE. With limited English Misao Nishitani could still enjoy the participation with other children, including “singing school.” Several times per year the children learned songs and then travelled to First Presbyterian in downtown Seattle for performing and hearing other branch-church groups. Misao remembered being awed by the powerful preaching of Rev. Mark Matthews, and by the large attendance at the downtown church. First Presbyterian sponsored outreach all over northeast Seattle and founded churches which still exist, including Lake City and University Presbyterian churches. Morningside organized as an official Presbyterian church on February 16, 1947 with 31 charter members. 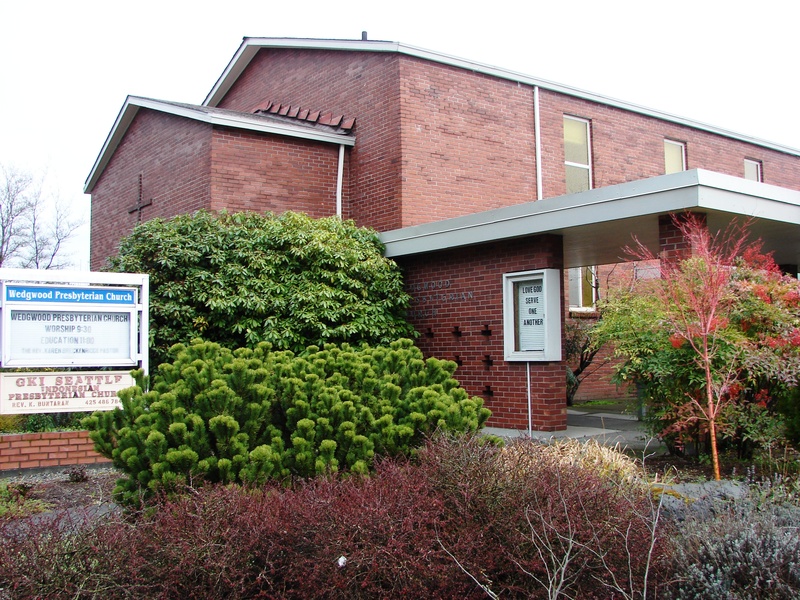 It changed its name to Wedgwood Presbyterian on September 10, 1950 as the church prepared to move to its present site at 8008 35th Ave NE. By 1930 there were about fifty Japanese families scattered through the northeast Seattle area from the University District out to present-day Lake City. Because Green Lake was a local landmark and site of commercial districts, it was chosen as the name when the Green Lake Japanese Association was formed in the 1920s. A donated building was used as a community hall for meetings, social gatherings, Japanese language classes and youth group activities. Judo classes, basketball and softball were some of the activities for the young people. Kelly Nishitani’s wife Pearl taught American cooking classes and she was an advisor to the Young People’s Club. In 1933 the girls’ cooking class put on a banquet for the boys’ basketball team in celebration of winning the league championship. Sixth and seventh Nishitani children George and Tom were star players on the basketball team. When Oriental Gardens was first established their advertising sign faced east onto Ravenna Ave NE which was called the Old Bothell Highway or Erickson Road. NE 98th was a through-street and Oriental Gardens was at that intersection. Not until later in the 1920s was the present Lake City Way put through, which was at first called Victory Way and then was called Bothell Way. With increased car traffic on this new road, the Nishitanis built a new retail outlet facing west onto Victory Way. Prior to that time they had mainly been wholesalers, supplying produce and cut flowers to stands operated by other Japanese in northeast Seattle. Increased road traffic and the general prosperity of the 1920s benefited the Nishitanis and they were able to make a living at Oriental Gardens to support their large family including Kelly’s wife Pearl and their two sons. Tragically Denjiro Nishitani did not live to see his family grow up; little did he know when he arrived in Seattle in 1906 that he would have only twenty more years to fulfill his dreams. He had an operation in 1924 and was never well again after that. He died on June 6, 1926, at age 47. The ten Nishitani children all distinguished themselves with lives of service, dedication to family and an emphasis on education, a legacy of Denjiro Nishitani’s hopes and dreams for a new life in America. 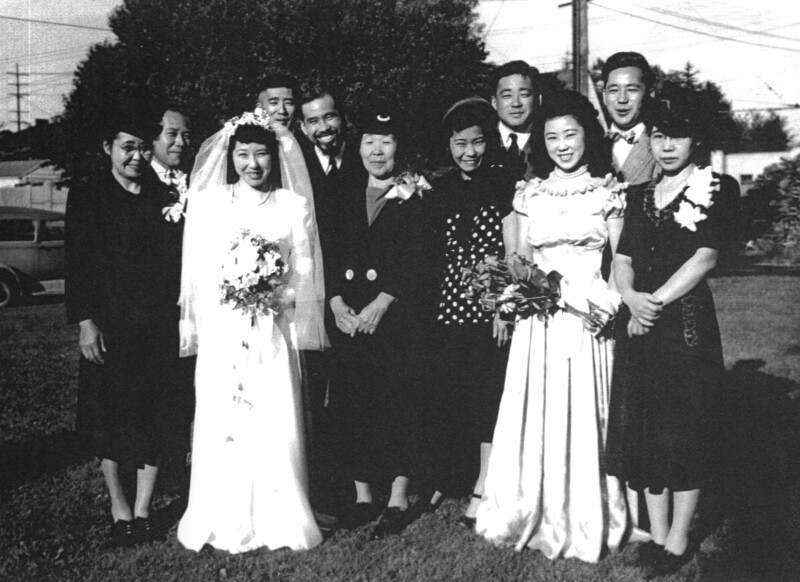 All ten Nishitani siblings gathered for the last time at the 1947 wedding of Connie, the tenth child. Mother Jin Nishitani is at center. Photo courtesy of Nishitani family; all rights reserved. Do not copy. Like most other Japanese on the West Coast, in 1942 all of the Nishitani family were sent to internment camps for the duration of World War Two, even the family members who were born in Seattle and were US citizens. They were able to leave Oriental Gardens in the hands of reliable operators and that is one of the reasons why the Nishitanis were able to retain their business and pick up their lives again after the war. Many other Japanese families in Seattle lost their businesses because they were leasing, or because they went elsewhere to live after the war. In the postwar period Oriental Gardens’ location proved ideal. The business was well-situated along the busy arterial Lake City Way NE as car traffic continued to increase in the 1940s and 1950s. There was a postwar housing boom throughout northeast Seattle, including the Wedgwood and Meadowbrook neighborhoods, with people interested in buying yard and garden products for their new homes, so Oriental Gardens had continued success as a retail outlet. The Dexter + Chaney Software company is in the commercial building on the site of the former Oriental Gardens. Kelly Nishitani died in 1969 and by that time his siblings and sons had all gone into other occupations, so Oriental Gardens closed. The late 1960s and early 1970s was a time when many other local businesses also closed, such as McGillivray’s Variety & Gift Store, McVicar Hardware, and Bud Gagnon’s Wedgewood Pharmacy. There were many factors which led to these business closings, including retirement or death of the owners. Other factors were competition with big-box chain stores and the economic slump called The Boeing Bust which began in 1968 and deepened in the early 1970s. 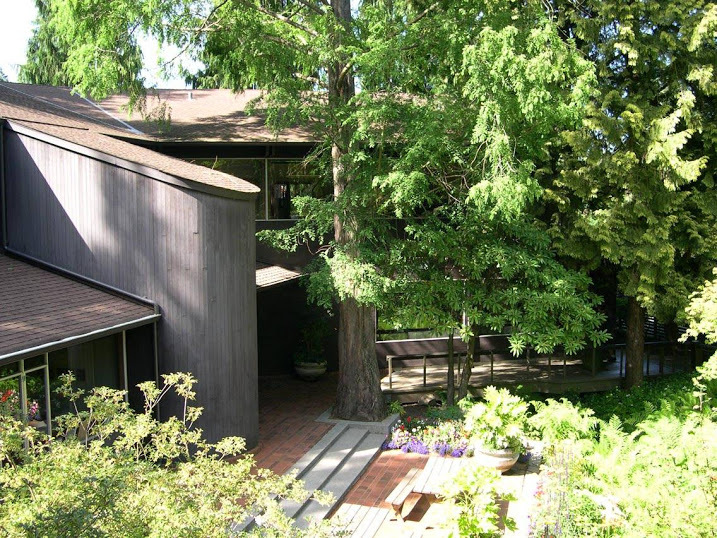 In 1971 the Oriental Gardens property was sold to the Bode family who built a new building for their Weight Watchers program. Fortunately the Bode family loved the Japanese landscaping and the creek which flows through the site of the former Oriental Gardens, and they preserved the site intact. In the 1990s Willow Creek was officially named in honor of the large willow tree which had been planted on the grounds by the Nishitanis. The present commercial building, now occupied by Dexter + Chaney Software, is nestled in a ravine next to the creek. Bridges connect the building with the landscaped parking area. Willow Creek flows under NE 98th Street and joins the main Thornton Creek at about NE 100th Street, off of Fischer Place behind the LaVilla Dairy building. Seattle Civil Rights & Labor History Project: Essay: White Supremacy and the Alien Land Laws of Washington State. Densho: history of the Japanese- American experience during World War Two. The Green Lake Japanese American Community: 1900-1942. 979.7772 G8238, Seattle Public Library. The Japanese Americans. Tony Zurlo, 2003. 973.04956 Z89J, Seattle Public Library. In 1993 I interviewed Martha Nishitani and her older sister Misao Sakamoto about their experiences growing up at Oriental Gardens, their school days at Maple Leaf Elementary and relationships in the neighborhood. 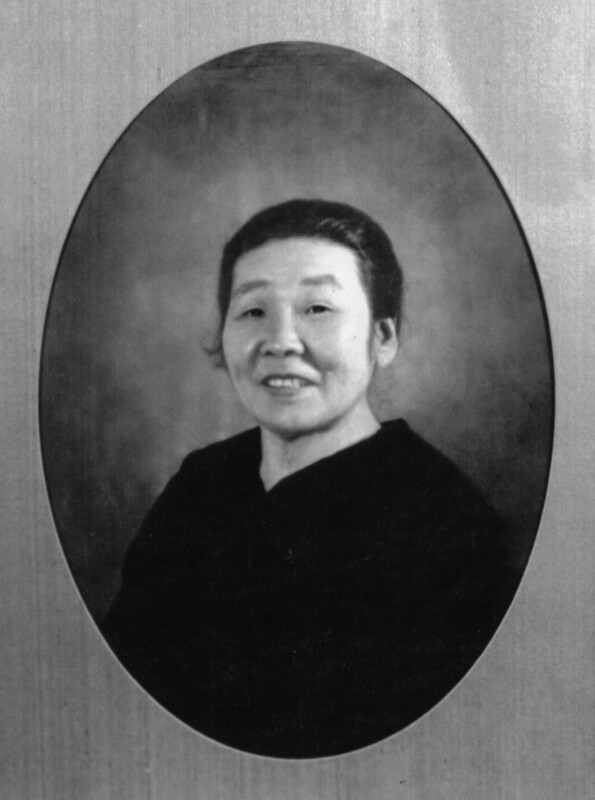 Martha Nishitani’s career as a modern dance teacher is described in HistoryLink Essay #10637 by Seattle historian Paula Becker. Misao was the widow of James Sakamoto, a newspaper publisher and leader in the Japanese-American community. This entry was posted in churches, Immigrant heritage, Meadowbrook neighborhood, School histories and tagged immigration laws, Japanese immigrants, Lake City Way, Neighborhood History, plant nursery, Seattle, Victory Way, Wedgwood Presbyterian Church. Bookmark the permalink.